To See or Not To See Each Other Before the Ceremony? 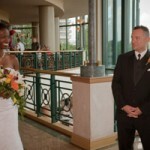 More couples are opting to see each other before the Ceremony if time between the Ceremony and Reception is short. 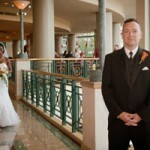 That allows the Wedding Party to go around town for photos at leisure before the Ceremony. Then you need to take fewer photos of the Wedding Party and Family at the Ceremony site and you can join the cocktail party sooner. You can still have that special moment with your groom by having your wedding planner and photographer stage a “first look” moment. Choose a special setting, maybe the hotel where you’re getting ready. The groom would be positioned so he can’t see you approach. And, when you’re ready, he would be told to turn around. 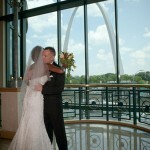 You’ll get that wonderful “first look” moment and the photographer and videographer can catch the moment, too. Many brides and grooms find that the “first sighting” actually gives them more time together for that special private moment than at the altar. And, it makes for fabulous photos. Wonderful idea to give you more time after the Ceremony for greeting guests and enjoying yourselves.